In your classroom, you witness so much learning happening every day. You see children gaining the fine motor skill development they need to write when they squeeze and mold playdough, or cut with scissors. You see them starting to grasp mathematical concepts when they sort and classify blocks by size or color. You see them wrapping their little brains around literacy concepts the first time they’re able to find their own cubby by reading the label with their name printed on it. Learning is all around your classroom—you know this because you plan intentionally for it. 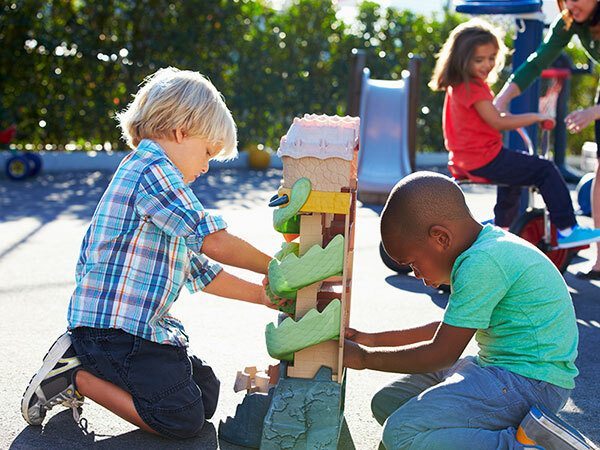 By choosing age-appropriate materials and furniture for your classroom environment, developing and implementing a lesson or activity plan, and engaging in meaningful interactions with children, you are working daily to provide a quality early childhood experience for every child that walks through your door. Much of this, however, happens “behind the scenes.” The families you work with don’t often get to see the time, research and thought that go into your environmental or lesson planning processes, and they may only get to witness a small snippet of your interactions with their children each day at pickup or drop off. Helping families understand what children learn that isn’t evident on a worksheet can feel like a challenge. Display evidence throughout your program that shows children involved in the learning process. This could be in the form of pictures, samples of children’s work, or written descriptions of what’s happening in your classroom. For example, take pictures of the children working together to build a castle in the block area. Then post those pictures on the wall of your classroom with captions describing what was happening in the picture. In your description, talk about what skills the children were developing during this process. Use actual quotes from the children, if possible. Post or hang signs in areas around your room that describe what children are learning as they play in those areas. “When I work in the sand table, I am learning concepts of size, shape and volume; how to use tools; how to solve problems; to observe changes (a science skill),” etc. Distribute print materials to families educating them about learning through play. This may be in the form of information that discusses the specific curriculum your program has chosen to utilize, or even articles from reputable sources (like publications from NAEYC or the American Academy of Pediatrics) that pertain to play-based learning. Invite families to participate in an open house / back to school / curriculum night, or a family discussion series that focuses on this topic. Families who attend can receive information from your program on learning through play, and they can have the opportunity to ask any questions they may have. Providing snacks and drinks, or even on-site child care, may help with attendance at events such as these! As early childhood educators, we are already well aware of the benefits of learning through play. Take the time to clue your families in to this same information in thoughtful, organized, professional ways that are sensitive to their needs. This not only demonstrates your expertise, and reinforces your role as an early childhood professional, it ensures the mission, vision and philosophy of your program is understood and shared by the families who choose to enroll. This entry was posted in Best Practice, learning through play, Parents on June 9, 2017 by Merideth Burton. I have never liked to say goodbye to those I care about. It felt better to say, “See you later,” or “Take care,” rather than “Goodbye.” Saying these phrases had less finality. It helped me feel at ease as I separated from my family and friends. Realizing how uncomfortable I felt saying goodbye to my loved ones helped me to understand the importance of supporting children as they learned how to cope with separating from their family for the day. Setting a mood in the morning can be a beneficial way of supporting children when they are dropped off. If the size of the classroom permits, provide a small couch or love seat for children to sit on with their families during a drop off routine (see below). Make sure children know where their personal items belong. When children have a space of their own in a classroom, it can add to the sense of belonging. Remember that if children are not ready to take off their coat or jacket right away, it is okay. They may need to hold on to an item from home to help them feel safe. It is also helpful to encourage families to bring in comfort items such as a blanket, a stuffed animal or photo book from home to help keep a connection between home and school. Greet every child and family member that walks through the classroom door. Make sure to use names; having a cheat sheet can be helpful in remembering everyone’s name. It is important for everyone to feel comfortable when they enter a classroom. When children see their teacher conversing with their family members, it helps to build the trust that is needed between teacher and child. It can be helpful to observe and reflect on the kind of support the child and family needs when a child is having a hard time separating from their family. Some children feel supported when their parent hands them off to their teacher. Others may just need some extra time with their parent, so encouraging them to create a drop off routine can be helpful (see below). Based on that routine, the teacher my need to remind children and their family what the routine is or to make sure all elements for that routine are available. It is best to refrain from being too forceful for the family to separate. This can be a sensitive and challenging part of the day for all involved. Sometimes a simple, “Let me know when you are ready to leave and I will help,” can be all that is needed. The important thing is to be available. Children thrive on consistency. Drop off routines can be successful in establishing smooth and consistent separation. Encourage families to think about what works best for them. Are they typically in a hurry or do they have flexibility to ease a child into the classroom? Encourage families to start off by helping children to put their items in their cubby and then washing their hands. A parent may be able to engage in some play with their child for a few minutes before leaving. Offer breakfast throughout the morning and make it a choice for children. Another routine that works well is for the family member to sit and read a book or two with their child before separating for the day. It may also be important for the adult to pick the number of books and stick to that number. This may be something that the teacher can help reinforce. Having several popular activities available for children to choose from can be helpful when separating for the day. Knowing children’s typical schedules and what their interests are can be helpful for children as they separate from their family. I had success opening the sensory table in the early morning. Sensory play can be a magnet for young children which can help children be ready to explore the classroom because it is interesting and fun, therefore saying goodbye may not feel so pressing and hard. This entry was posted in Best Practice, Infants and Toddlers, Parents, Preschool and tagged feelings, social emotional development on June 1, 2017 by Jamie Webb. As the parent of a “spirited” child, I myself get anxious about parent-teacher conferences! No matter how nervous we may be prior to a conference, the parents of “spirited” children are just as anxious. Don’t forget these are the parents who are probably growing accustom to only hearing the negative or challenging aspects about their child. They consistently feel as if they need to defend their children because all they hear is the bad, and they know there is good inside there too! Keep in mind every parent loves to hear positive and funny stories about their children; that’s a great place to start the conversation. Interact with the children in your care. This should occur constantly throughout the year, everyday—not just before conferences. If you’re not interacting with the child chances are you have very little information on that child. As you interact with children, engaging them in play and conversation, you’re able to discover their skills, abilities, and developmental levels. You also establish what their interests are which you can use to entice them to learn or enhance skills. Determine goals based on those everyday interactions. Where does this child need support? I found sometimes starting with a few goals is more productive than having goal overload. It’s easier to focus and plan for between one and three at a time. Plus this focus and planning will increase the child’s chances for success surrounding that goal. More goals can always be added later when the child is ready. Allowing the parents the option to add a goal is a great way to create a teaching team between school and home. Create an action plan of how you’re going to support that child with each goal. This is the step a lot of teachers skip. Children don’t magically develop the skills needed to reach our goals, they get there through play, repetition, and our intentional planning. Document and explain to parents what YOU are going to do to help support their child using concrete examples. For instance, if Johnny’s goal is to recognize his name in print, but avoids the writing center like the plague, how can you use Johnny’s interests and favorite areas to intentionally plan for letter recognition through play? What kinds of playful interactions can families do at home to reinforce concepts and skills? I’ve found that suggesting “activities” to parents adds pressure and more often than not, there’s no follow through. However, everyday, intentional interactions are much easier steps for parents because there is no prep time or materials to gather. It can simply happen in the car or during dinner. Communicating your action plan takes some of the anxiety off parent’s shoulders and gives them ideas of how to make learning fun. Plus, it puts them more at ease during the meeting knowing you already have a plan to help their child. Again this helps create the teaching team between school and home. Put it all in writing. Prior to the meeting, document your talking points, goals and action plan examples to ensure you’re not forgetting anything. It’s not only professional, but when parents see that you’re plan is documented, they know you’re going to follow through. Most importantly please remember, regardless of what our biases and opinions are telling us, ALL parents want their children to be successful. Some parents just show it in a different way than others. And some parents just don’t know or realize what they can do to help their children be more successful. That’s where you as the early childhood educator come in! This entry was posted in Parents, Preschool, teachers and tagged how to talk to parents, relationships with parents on December 19, 2016 by Tracy Schnirring. Early childhood educators must balance the culture of each child’s family, the classroom, the program and even the curriculum! The word culture can mean different things to different people depending on the circumstances of its context and even setting. So what exactly is culture? When I think about culture the word values immediately pops into my head. If you read the Merriam-Webster definition of culture, it’s a pretty complex subject. In the field of early childhood education, we have many cultures to uphold and honor intertwined in our classrooms. We not only balance the culture of the family, but that of the classroom, the program, community, and even the curriculum—that’s a lot to balance! So what happens when conflicts occur between the family culture and the culture of your classroom? When conflicts occur between the cultures, emotions typically are running at high speed with all parties involved. Not only do families hold their cultural beliefs very close to their hearts, but the majority of professionals in this field do as well, which can make it difficult to negotiate and problem solve. I think it’s important for us as educators to remember that not everything in early childhood education is black and white; there is a lot of GRAY area, especially when it comes to balancing cultures. One way educators can do this is by being reflective and asking themselves or even the families, “Why?” One way to achieve understanding and to maintain positive relationships with families is for educators to demonstrate the ability to host respectful conversations around the topic. Hosting these types of conversations with an open mind will allow educators to use the families as a resource and can even strengthen relationships as you bridge the gap between home and school. It may also help educators detect what the family’s true needs are. Understanding the “why” factor is an important piece for educators during the problem solving and individualizing process. As educators begin identifying what is causing the conflict between cultures, they will also discover what barriers exist. Once you isolate what the need is, you can pinpoint where the conflict between cultures occurs; then you can begin to strategize possible solutions for adaptation and individualization. Try asking yourself, “Why not?” Does it go against program policy, is it a licensing violation, or does it create management issues? Next ask yourself, is there room for ANY adaptation? Am I being flexible, and I am I viewing this with an open mind? Chances are the topic in question is already something that the child has been exposed to; it’s familiar to them. Best practice in ECE would encourage the implementation of scaffolding techniques and adaptations for the child and family when appropriate and possible. When brainstorming solutions with families, it’s important for educators to respectfully articulate the “why” factor on your end too. Ideally, this will help guide you through compromise, foster the relationship, and allow you to begin advocating for what is best practice in early childhood education, while at the same time trying to honor the family culture. After all, respecting the family culture is respecting the child. This entry was posted in Best Practice, Parents and tagged culture, family culture, relationships with parents, tradition on August 25, 2016 by Tracy Schnirring. Lemonade stands are a quintessential summertime activity for kids of all ages. What better time to use a child’s math skills to make the stand successful. It all begins with measurement skills to mix the lemonade. From simple measuring to doubling the recipe, children can use these proficiencies to make sure everyone in the neighborhood is able quench their thirst on a hot summer day. Math skills can be extended through the counting of money and making change for customers. We can’t fail to mention an early lesson in sales and marketing with a discussion on how to attract customers and be the best salesman. Keep science alive by planting a garden! Gardening almost seems like a lost art, but imagine all the hands on experience children can get through planting and tending a garden. From preparing the proper space, measuring rows and watering and sustaining the garden, to harvesting and discussing the nutritional value of the crops. Use baseball games to keep siblings engaged in learning by asking questions about the score, how many more runs the team needs to catch up, and having them tally balls and strikes. Sporting events of all kinds are great opportunities for discussing strategies for plays, practicing math skills and even working on those social emotional skills that involve teamwork and sharing. Make sure to take many field trips to the local library to keep the children reading. Sign up for your local library’s summer reading club, and help each child reach their goal. Whether families are going to the beach, the neighborhood park, or setting up a lemonade stand, learning is all around! It’s our responsibility to partner with parents to help their child succeed, and one way to do this is to share with them how they can support their child’s learning when they are not in your program. This entry was posted in Early Childhood, learning through play, Parents and tagged avoid summer slide, summer learning on June 30, 2016 by Kelly Ely.